20'000 FEET by the record-breaking mechanical timepiece ! Shattering existing limits: such is the motto of the CX Swiss Military WatchTM brand, which is proudly unveiling its record-breaking 20’000 FEET watch, the only mechanical timepiece able to plunge more than 6,000 metres deep! Duly featured in the Guinness Book of Records, the 20’000 FEET fears nothing: neither the pressures equivalent to 750 kg/cm2 exercised at the bottom of the ocean; nor a dynamite blast; nor even rifle bullets. Such unwavering resistance and reliability are bound to fascinate enthusiasts of the extreme. The three Real Life Tests to which the brand has subjected its chronograph confirm its extraordinary performances. Whether fired at by a Winchester rifle from a distance of just eight metres; placed on an explosive charge blasting at a speed of 5,000 metres/second; or submerged by water spurting at 6,000 litres/minute: the 20’000 FEET remained completely unperturbed and its hands continued to turn as if nothing unusual were happening. The one result still lacking is that of the freefall test scheduled for this autumn: after jumping out of an aircraft at an altitude of 20,000 feet (6,000 metres), a parachutist will drop the watch as soon as he reaches a height of 1,5000 metres. Will he find it intact after impact? In developing this imposing time instrument, the ultra-confident team at CX Swiss Military WatchTM believes it has taken account of every possible trial and risk, to the point where it even encourages you to submit your own ideas for ambitious and unexpected Real Life Tests! At the end of the year, the person who has suggested the most original test will be rewarded with one of these exceptional timepieces. 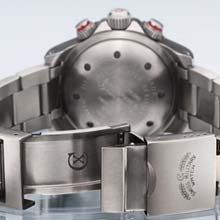 A COSC-certified automatic chronograph endowed with a 48-hour power reserve, the 20’000 FEET is equipped with a 46 mm-diameter case carved from a block of titanium, a 10 mm thick domed sapphire crystal, an Incabloc shock-absorbing system, as well as a rugged titanium bracelet complete with safety folding clasp. Despite such impressive credentials, this diver’s watch feels extremely comfortable on the wrist, since the geometry of its hypoallergenic case was specially developed to ensure a perfect fit. Designed as an outstanding complement to professional diving equipment, the 20’000 FEET has earned a new world record for Montres Charmex SA, the parent company of the brand specialising in watches for top-class military and sports use. Following on from the certification of a water resistance record set by the 12’000 FEET watch in 2005 (3,657 metres), this year the firm is celebrating official recognition of its 20’000 FEET – which steals the show from its competitors of most prestigious brands! Nonetheless, the brand has no intention of resting on its laurels and is already in hot pursuit of other high goals. This determination to excel displayed by Montres Charmex SA is backed by another essentially altruistic objective. As a contribution to preserving nature and its essential biodiversity, the brand has decided to support a magnificent African national park in Zimbabwe: part of the revenue from the sale of each 20’000 FEET watch will therefore be donated to The Friends of Hwange foundation (www.friendsofwange.org), which was established with the mission of developing this park. Helping to protect the nature is a top priority for this brand that has consistently invited its customers to explore the bounties of nature. Titanium, diameter 46 mm,  thickness 28.5mm, weight 265gr. Anti-magnetic, ISO 764. 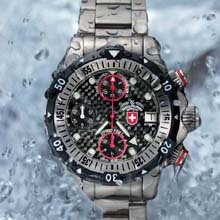 As an additional service for its customers Montres Charmex SA signed a contract with the Swiss insurance company Helvetia to insure the 20’000 FEET by CX Swiss Military Watch™ against theft for the first two years.